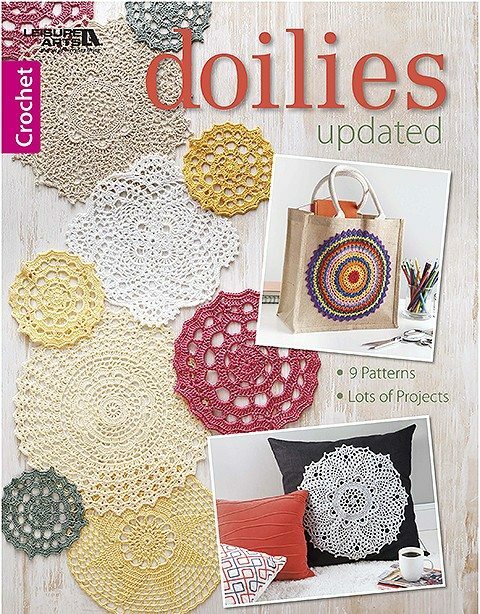 I’m loving the book Doilies Updated because it isn’t just a set of crochet patterns but also an inspirational resource for what to do with various crochet motifs. 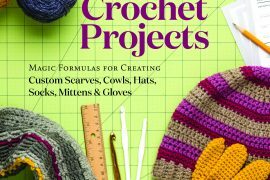 There are nine crochet motif patterns in this book. 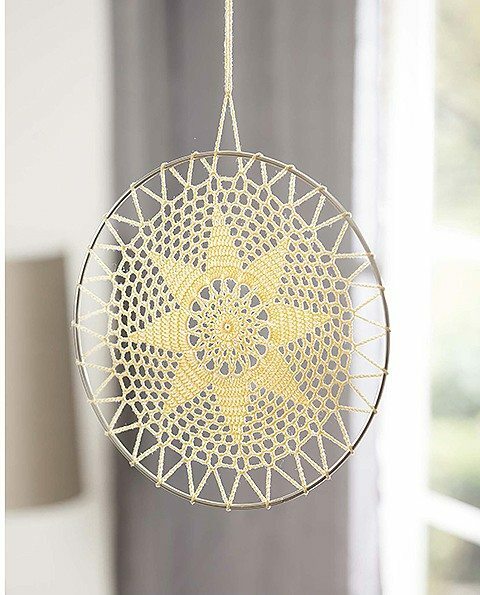 Some look like what you would traditionally think of as doilies. 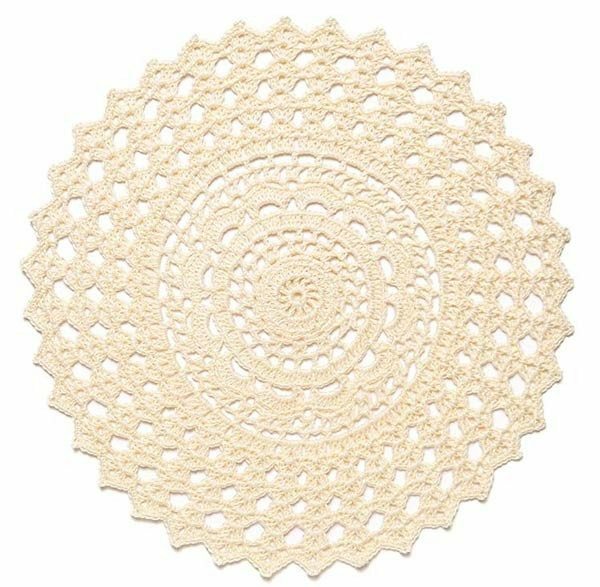 At least one is a colorful take on the doily that hints at the popular crochet mandala idea, which itself is, of course, a variation on the doily. A couple go beyond the classic round doily shape – oval, triangle and square are all represented – but still draw from the delicate in-the-round style of doilies. 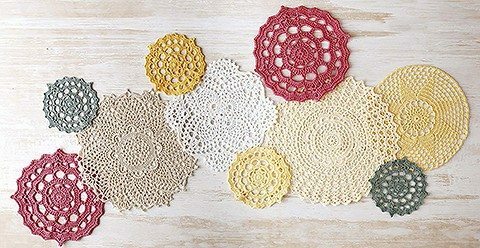 Each of these crochet doilies is a nice pattern on its own. What I really love about this book, though, is that it is more than just a collection of nine crochet patterns. Each pattern also shows different crochet projects that can be done with that motif. This serves as a great well of inspiration for additional projects that can be made using not only the doilies in this book but also other favorite motif patterns. The projects themselves have tutorial instructions for completing them, which is great, but I also just really appreciate the ideas that it generates. 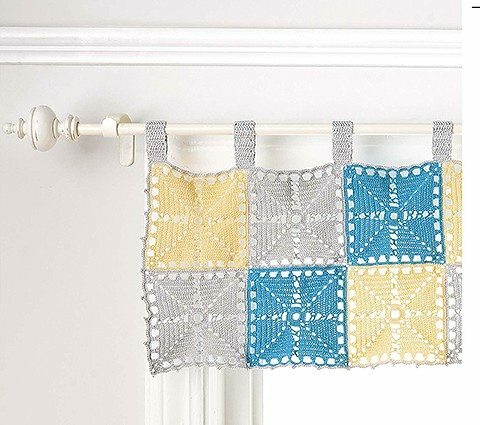 We see ideas for using single doilies in large format to create items like chair pads and sun catchers, adding single doilies to fabric to decorate pillows and totes, and joining multiple doilies together to create bunting and curtains. In some cases the project examples give us a chance to see some really great variations on the doily pattern. For example, the Mandala Tote (which can be seen on the cover of the book) is a very colorful version of the Round Doily, shown in a single neutral color (cream) in the book. Then we see the same round doily worked in a different single neutral color (grey) but a bulkier weight so it makes a large round rug. This shows that you can change colors, yarn, hook size, etc. to create entirely different projects from the same motif. Most crafters know this but it helps to see different options to refresh how we see our patterns. 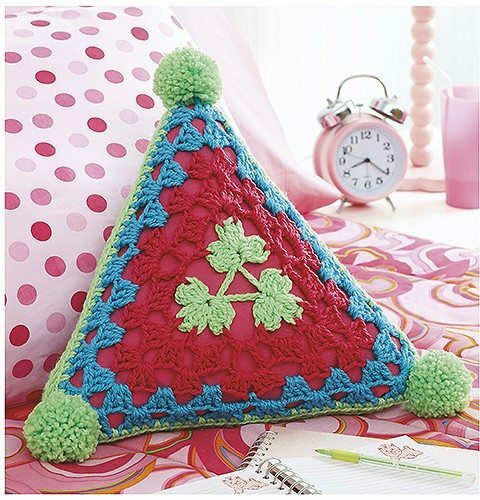 Likewise, we see how to crochet a triangle doily, which is a variation on the granny triangle (with a crochet shamrock center). First we see it worked in a single color of lightweight yarn. Then we see how to make a large version in three colors, with pom poms on each end to create the front of a triangular pillow. And then we see how to make a smaller version in different colors to create bunting that wraps around a tote bag. Such fun ideas! 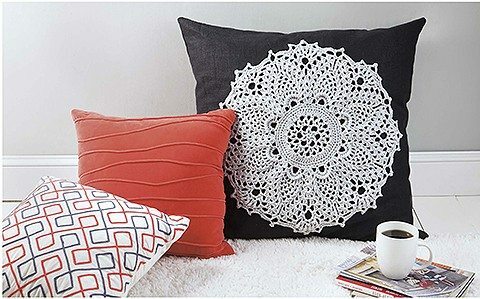 The crochet projects in Doilies Updated are a mixture of easy and intermediate projects. 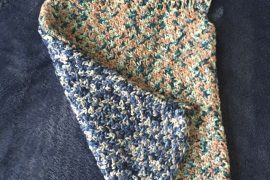 They use a really great array of different yarn types, so there are options for different preferences all the way from weight 0 “lace weight” crochet thread to weight 6 “super bulky” yarn. 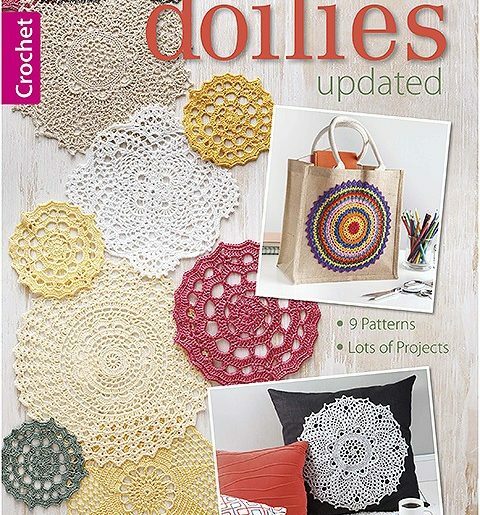 In general the doilies themselves are shown worked in lace weight yarn and the projects are where we see the range. The doilies primarily use the basic crochet stitches; a few advanced stitches include clusters, post stitches and picots. Each pattern comes with detailed round-by-round instructions along with additional finishing information; diagrams are included where necessary. The projects include additional info for using the doily patterns to make useful household items.